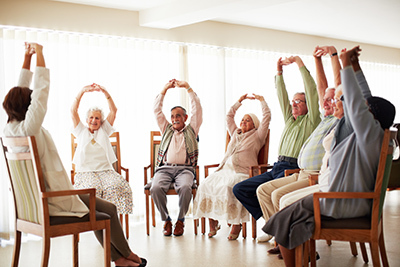 Move More was developed in 2014 to promote physical activity for older adults. An evaluation was done to understand what worked well, what could be improved and also to make recommendations for the future of Move More. The goal of the Move More initiative is to encourage residents and team members to add more movement into their daily routines. This could be as simple as taking the stairs instead of the elevator or self-propelling in a wheelchair to the dining room. Move More looks different at each of the retirement and long-term care homes involved because they were encouraged to do what works best for them. The evaluation included interviews, focus groups, and a survey and involved over 150 participants. Overall, Move More was well received by residents, team members, and family members. Some of the strengths of Move More include: the concept is simple and positive, the activities are unique, the resources are well received, there is consistent support, and friendly competitions contribute to the spirit of Move More. Some of the challenges include: it was at times difficult to get people involved, it can be hard to come up with new and realistic ideas for moving more, and lastly there was some disconnect between people’s understanding of Move More. Overall, the evaluation showed that residents are happier, experiencing a stronger sense of purpose, are more connected to others, and are more active. Team members are happier and more motivated, more physically active, and feel empowered.